Welcome to this month's Constellation Showcase! This monthly segment details a currently viewable constellation, typically somewhere along the ecliptic or high in the Northern sky. This month we're going on a tour of Andromeda, home of our neighbor, the Andromeda Galaxy! 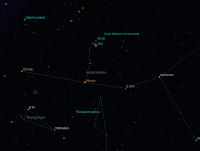 In the star chart to the right, you can see the constellation Andromeda. Note how it actually is partially attached to the constellation Pegasus. Andromeda is easy to find during November. Look overhead around 9-10 PM local time and find the square of four bright stars. This is Pegasus. To the East of Pegasus, note the line of stars that seems to have a branch sticking out of it. This is Andromeda, and at the very end of that "branch" is the Andromeda Galaxy! In Greek mythology, Andromeda is sometimes called the "chained maiden". Andromeda was the daughter of Cepheus and Cassiopeia, king and queen of Ethiopia. Cassiopeia boasted that her daughter was more beautiful than the Nereids (sea-nymphs). Poseidon, outraged at her blasphemy, sent the sea monster Cetus to chain Andromeda to a rock by the sea. Perseus then found Andromeda, destroyed the sea monster Cetus, and rescued Andromeda. The most interesting thing in Andromeda is, by far, the Andromeda Galaxy. This huge spiral galaxy, also commonly known as M31, is very similar to our own Milky Way galaxy. The Andromeda Galaxy is a good bit larger than our own galaxy, though, and is theorized to contain about a trillion stars. In the picture at left, you can see the Andromeda Galaxy with its satellite galaxies, M32 and M110. Our own Milky Way galaxy has several small satellite galaxies, also. One notable thing about the Andromeda Galaxy is that it was the object that showed us that our galaxy is not the only galaxy. The Andromeda Galaxy is also one of the most distant objects visible to the naked eye, at about 2.5 million light-years away. On a dark night, the Andromeda Galaxy can be seen with the naked eye as a gray smudge in Andromeda. The Andromeda Galaxy is actually speeding towards our Milky Way at approximately 100 kilometers per second. At this rate, it will collide and merge with our galaxy in about 2.5 billion years. After the merger the two galaxies will form an enormous elliptical galaxy. Even during the merger, however, the chances of any stellar systems colliding are extremely low.